As No Jitter readers surely understand, communications and collaboration can be a competitive differentiator, enabling the agility their companies need to survive and, more importantly, thrive in today’s fast-paced economy. Companies are best served when they give their users the ability to collaborate from within a single, unified platform. Consider the alternative: Users waste time toggling from one app to another (phone, chat, email, etc. ), breaking the creative flow, slowing the overall process, and leaving them scrambling to put information into context -- time and time again. An integrated platform that facilitates collaboration with workers both inside and outside the organization, on the other hand, breaks down workforce barriers that limit productivity, inhibit teamwork, and tamp down innovation. As I discussed in my previous post, “5 Considerations for Evaluating Your Next Communications Platform,” we call this collaborative communications. Users have the same delightful experience in how they communicate, collaborate, share content, and manage projects. Collaborative communications has no boundaries. This experience is across voice, video meetings, app integrations, and more, with team messaging at the core and device independence a given. 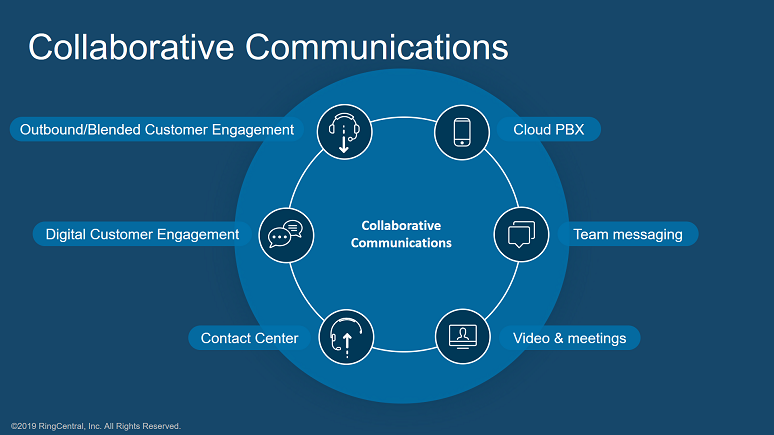 Ultimately, collaborative communications is about allowing greater agility and productivity across a far-flung workforce leveraging an open and intelligent cloud-based conversational platform that supports integrations, chatbots, and artificial intelligence. And collaboration communications doesn’t stop at the firewall. With an open, intelligent cloud-based conversational platform, you can support seamless collaborative experiences not only for internal teams but also for communications with customers and partners. Are you ready to empower your company? Get the perspective you need at a glance in this infographic, “Power to the People: The Rise of Collaborative Communications.” Download now.